As wearable devices are emerging, there are numerous studies on wireless charging systems. Here, a KAIST research team has developed a permanent, wireless self-charging platform for low-power wearable electronics by converting near-infrared (NIR) band irradiation to electrical energy. This novel technology can be applied to flexible, wearable charging systems without needing any attachments. Colloidal-quantum-dots (CQDs) are promising materials for manufacturing semiconductors; in particular, PbS-based CQDs have facile optical tunability from the visible to infrared wavelength region. Hence, they can be applied to various devices, such as lighting, photovoltaics (PVs), and photodetectors. 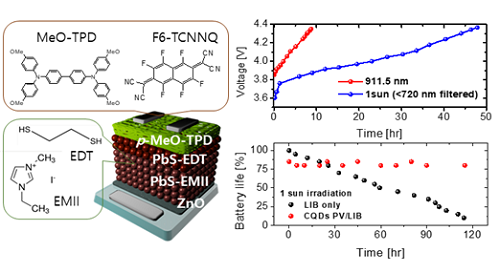 Continuous research on CQD-based optoelectronic devices has increased their power conversion efficiency (PCE) to 12%; however, applicable fields have not yet been found for them. Meanwhile, wearable electronic devices commonly face the problem of inconvenient charging systems because users have to constantly charge batteries attached to an energy source. 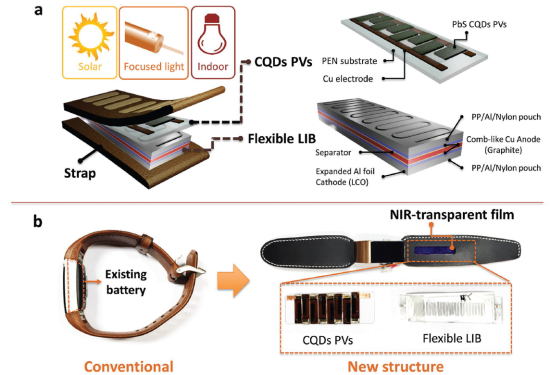 A joint team led by Professor Jung-Yong Lee from the Graduate School of Energy, Environment, Water and Sustainability and Jang Wok Choi from Seoul National University decided to apply CQD PVs, which have high quantum efficiency in NIR band to self-charging systems on wearable devices. They employed a stable and efficient NIR energy conversion strategy. The system was comprised of a PbS CQD-based PV module, a flexible interdigitated lithium-ion battery, and various types of NIR-transparent films. The team removed the existing battery from the already commercialized wearable healthcare bracelet and replaced it with the proposed self-charging system. They confirmed that the system can be applied to a low power wearable device via the NIR band. There have been numerous platforms using solar irradiation, but the newly developed platform has more advantages because it allows conventional devices to be much more comfortable to wear and charged easily in everyday life using various irradiation sources for constant charging. With this aspect, the proposed platform facilitates more flexible designs, which are the important component for actual commercialization. It also secures higher photostability and efficient than existing structures. This research, led by PhD Se-Woong Baek and M.S. 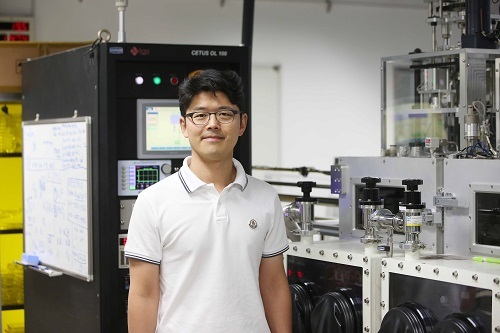 candidate Jungmin Cho, was published in Advanced Materials on May 11. Figure 1. a) Conceptual NIR-driven self-charging system including a flexible CQD PVs module and an interdigitatedly structured LIB. b) Photographic images of a conventional wearable healthcare bracelet and a self-charging system-integrated wearable device. Figure 2. Illustration of the CQD PVs structure and performance of the wireless self-charging platform.